Roy of the Rovers is a legend. Melchester Rovers’ blonde haired superstar striker with the lethal left foot is nothing short of a footballing icon, a comics institution, and a household name. Roy Race’s story began way back in 1954, and by the time he graduated to his own Roy of the Rovers comic in the late 1970s, sold hundreds of thousands football-mad fans were following his exploits every week! Roy’s story eventually ended in 2000, and since then he’s been on the subs bench. But no more! We’re bringing back Roy of the Rovers for a new era! That’s right, Roy has been rebooted – and he’s now 16, and just starting out on his career in football. So what can you expect from the brand new Roy of the Rovers? Well, obviously goals, glory and football drama galore, but also a modern spin on the classic character that will appeal to a whole new generation of football fans! We’ve teamed up with some awesome partners, such as the Totally Football Show, Match of the Day Magazine, Hummel, the National Literacy Trust and The FA, to bring you a thrilling new football comic unlike anything else! We’re publishing two series of books, which all tie together to make one epic Roy of the Rovers story, and we’ll also be reprinting classic comics, and issuing things like classic Melchester Rovers shirts. We’re releasing illustrated fiction books (these are middle grade novels, with a few black and white illustrations throughout) and graphic novels (think of these as posh, hardback comics), timed to coincide with the football season. 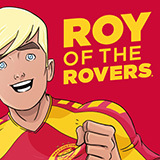 Head over to our shop to grab your copies of the new Roy of the Rovers books! Here’s what’s already out there – and what’s coming in 2019! Roy Race is the most talented striker in Melchester– but is he good enoughto catch the eye of the Melchester Rovers scouts? Roy Race is 16, talented, and desperate to make it as a footballer. But is he good enough for Melchester Rovers? Now’s the time to prove if he’s got what it takes to become Roy of the Rovers. Out: February 2019 PRE-ORDER NOW! Life gets tricky for Roy as he adjusts to life in the spotlight. Fortune and glory await, but can Roy juggle football, fame and family? Out: March 2019 PRE-ORDER NOW! Crunch time for Rovers: the end of the season is here, the club is in deep trouble, and it’s down to Roy to bring a bit of hope back to the Melchester faithful. Roy and the team have battled through a tough season, but have they got enough left to get promoted? Or will they fall at the final hurdle and see the club sold by its greedy owner? Follow us on Twitter, Facebook and Instagram for all things Roy, and check back here at the official Roy of the Rovers website for news and updates! A new era begins, and it’s real Roy of the Rovers stuff! Classic Roy of the Rovers calendar out now! Roy Race changed my life!